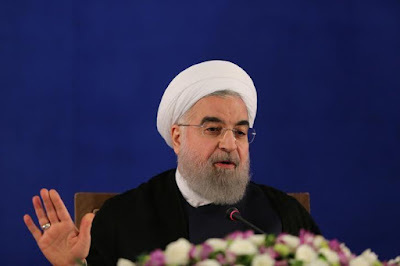 Iranian President Hassan Rouhani voiced support on Sunday for Qatar in its confrontation with Iran's rival Saudi Arabia and its allies, saying a "siege of Qatar is unacceptable", the state news agency IRNA reported. Saudi Arabia, the United Arab Emirates, Egypt and Bahrain cut ties with Qatar on June 5, accusing it of support for Islamist militants, an allegation Qatar denies. They have since issued 13 demands including closing Al Jazeera television, curbing relations with Iran, shutting a Turkish base and paying reparations. "Tehran stands with the Qatari nation and government... We believe that if there is a conflict between regional countries, pressure, threats or sanctions are not the right way to resolve differences," IRNA quoted Rouhani as telling Qatar's emir, Sheikh Tamim bin Hamad al-Thani, in a telephone call. "The siege of Qatar is unacceptable to us... The airspace, land and sea of our country will always be open to Qatar as a brotherly and neighboring country," Rouhani said. Doha, whose neighbors have closed their airspace to Qatari flights, has said it was reviewing the list of demands, but said it was not reasonable or actionable. Shi'ite Muslim Iran and Sunni Saudi Arabia accuse each other of subverting regional security and support opposite sides in conflicts in Syria, Yemen and Iraq.